Safety barriers are necessary in many types of work. For example, they may be important in warehouses when extremely heavy items are being lifted into the air and moved. Or they may be necessary on the road to protect construction crews from being hit by moving vehicles. Sometimes safety barriers are needed to close a retail area off while dangerous work is being carried out. If you are injured by a lack of safety barriers on the job, you probably are entitled to workers' compensation benefits. However, it may be difficult to get them. The Boston workers’ compensation attorneys at Pulgini & Norton can provide aggressive and knowledgeable legal representation for claimants. If you are injured by a lack of safety barriers, you should secure medical treatment right away. An employer may require that your first scheduled appointment for injuries be with a health care provider within a preferred provider arrangement. Other than that, in Massachusetts, you have the right to select your own health care professional for treatment. You may change the professional once without permission from the insurer. Seeking medical care right away may reduce the risk of a long-term disability. Your employer is probably aware of any injuries resulting from a lack of a safety barrier, but you should still provide written notice. If you are not able to earn your full wages for five or more full or partial days, the employer needs to electronically file an Employer's First Report of Injury or Fatality. This needs to be filled out in a timely fashion, or a fine may be imposed on your employer. Your employer also needs to provide the adjustor with any documents that they need to process the claim appropriately. In addition to medical benefits, you may also be eligible for disability benefits and loss of function or disfigurement benefits. You may get total temporary incapacity benefits if you are unable to work for six or more full calendar days, based on your experience, training, and age. You may get 60% of your gross average weekly wage. The most that you may get is the state average weekly wage, which is set each year by the Massachusetts Division of Unemployment. These temporary benefits are available for up to 156 weeks. 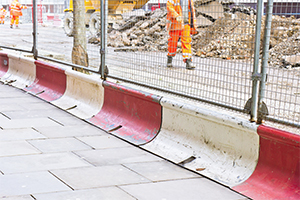 If you are totally and permanently unable to work as a result of injuries due to a lack of safety barriers, you may get total and permanent incapacity benefits. For example, if you are permanently paralyzed because a car struck you while you were working on a road construction project, you could potentially qualify for these benefits. You do not need to exhaust your temporary benefits to get these benefits, which are two-thirds of your average weekly wage based on the year before your injury, up to the state average weekly wage. In addition, you are entitled to annual cost-of-living adjustments. If you suffer scarring or disfigurement on your face, hands, or neck, or you can no longer use a body part, you may also get a one-time payment for this loss of function or disfigurement. Your employer should use safety barriers on dangerous jobsites. If you are hurt due to a lack of safety barriers, you may be entitled to workers' compensation benefits, regardless of fault. The Boston lawyers at Pulgini & Norton may be able to provide advice and aggressive representation for your claim. We handle claims in Brookline, Lowell, and Medford, among other Massachusetts communities. For a consultation with a workplace accident lawyer, contact us online or call 781-843-2200.